Pet lovers around the world are traveling more often with pets in tow, especially their dog. And why not? Your best friend is always up for a new adventure, and he could probably use a change of pace or scenery as much as you. With summer just around the corner, it’s time to consider a visit to the beach. But where can you go, if you’re in Europe? Some spaces are wide open – available for your enjoyment in whatever way appeals to you. But many European beaches are officially-designated spaces with umbrellas, lounges, a variety of dog-forward amenities and plenty of rules you’ll need to follow. Many have admission fees, and the popular ones all strongly urge advance reservations to ensure you and your pooch can partake of the beach on the day of your choice. Britain’s Mirror says “a million mutts have taken the Eurotunnel since 2012.” Of course, they didn’t all go to the beach. However, the Mirror specifically mentions the dog-friendly town of Varenna on the shores of Lake Como in Italy, where the beach beckons both dogs and their humans to dip their toes in the water. Should either of you become peckish, the paper says the local restaurants are “remarkably tolerant,” even of dogs inclined to work the room for pizza handouts. Where else might you and your pup find beachside bliss? Umbrellas, sun beds and free poop bags for you, plus dog showers and food bowls. Everyone is free to swim. A “nice hidden place” in the little fishing village of Howth, at the northern edge of Dublin. Billed as “the Mediterranean’s first official canine beach.” The locals hope you and your pup will join them. This beach is located in the center of town and welcomes small to medium size dogs. And it’s a hearty welcome, with umbrellas and chairs plus dog bowls, water, snacks obedience classes, an agility course and a dog-friendly pizzeria. This beach is just over a mile down the road from the town of Potami, which means “river” in Greek. You can relax on the pebbly beach or swim in the deep, still water. This very large fully-enclosed beach area allows humans ONLY if they are accompanying their dog! Yep, dogs are required. Surfside umbrellas, an agility area, showers, dog mats, bowls...and coming this summer, double the space, including a separate area for small dogs. Three miles of beach to romp on, including England’s largest collection of sand dunes. This beach is located between Braunton and Croyde. Dogs are allowed any time of the day at this pretty beach in the southern part of Sweden. The name says it all – chairs and umbrellas, leash holders and water bowls, swimming for pooches and people alike, and a place to wash your dog afterward. Your dog may not care, but if you go at the right time, you can enjoy the tulips as well as the beach. Part of the beach is open to pups year-round, and one section is dog-friendly only from September to May. What is your dog’s favorite beach in Europe? In the end, “best” depends on what you and your pup like to do at the beach. Which could be body surfing, chasing waves (or birds or resident crustaceans), digging holes, or flopping out in the shade. The beaches we’ve listed here – and undoubtedly many more -- are all known to welcome dogs. Some of them obviously go out of their way to offer tail-wagging canine amenities. But few dog-friendly beaches in Europe have been reviewed by their visitors. How are you and your pooch to know what’s really what? 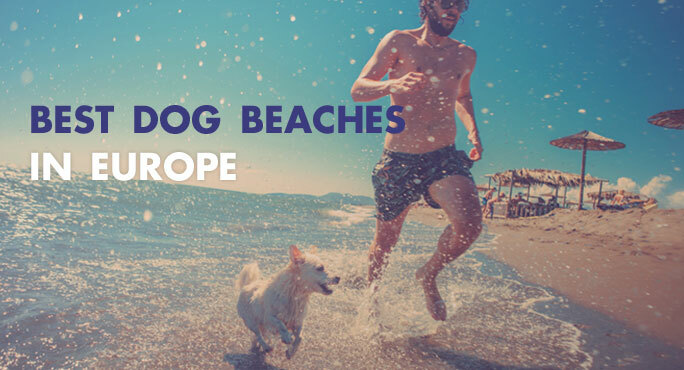 Why not make it your mission to visit European dog beaches with your four-legged critic in tow, with a goal of spreading the word – whether you had the time of your life or it wasn’t worth a woof? Just think of all the other dog lovers out there who could benefit from your insights as well as your canine’s perspective. Feel free to contact us for you traveling needs to or from Europe. We are experts in safe and worry- free pet travel.